The Scottsboro Police Department has a very long history, consisting of many stories, past chiefs, and acts of bravery. From this page you can read more about how the Scottsboro Police Department was established, how it now functions, and everything along the way. In the beginning, law enforcement functions for the Community of Scottsboro were provided by the County Sheriff. This arrangement continued until 1867 when our community acquired its first jail facility. This was accomplished by the act of 1867 when Scottsboro was selected as the County Seat and a jail was provided for the County Sheriff. In February 1869 the Governor of Alabama, William Smith, appointed the first mayor and four council men for the Town of Scottsboro. During the first meeting of the council, I. M. Cunningham was appointed as the Town Marshall of Scottsboro thus making him Scottsboro's first official law enforcement officer. The Marshall was able to hire and use Police Officers in the town as needed in his absence or to maintain the peace. Thus forming the Town of Scottsboro Police Department. The Town of Scottsboro became the City of Scottsboro in 1932. By the time Scottsboro became a city the Police Department was well established with its own City Jail. The Scottsboro Police Department has lost one officer in the line of duty. This was Officer Wayne Boggus on August 8, 1963. The City of Scottsboro and the Scottsboro Police Department have continued to evolve over the years. Both the City and the Department have tripled in size over the past thirty years. The Police Department has advanced from a small town police department with minimum resources to a department with the most technically advanced equipment available to police departments of this size or larger. On Thursday, August 8, 1963 Scottsboro City Policeman Wayne Clifton Boggus, 41, was fatally shot by an ex-convict, Alfred Brown, after he was placed under arrest on a drunk and disorderly conduct charge. Officer Boggus was a member of the Scottsboro force for only four months. According to Scottsboro Police Chief Ernest Swaim, Boggus and Officer Robert Junior had gone on duty at 10 P.M.. Officer Junior was answering a call that a person was wantonly shooting a pistol at Mac's Cafe on North Houston Street. When Junior arrived, Brown had left the scene. Officer Junior returned to City Hall with an unidentified complainant to obtain a warrant for the arrest of Brown on a charge of discharging a fire arm in the city limits. Officer Junior returned to Mac's with the unidentified person and saw the owner of the cafe standing in the street with a rifle and told the officer he would shoot Brown if he returned to his place of business. Officer Junior called for assistance from Boggus, who rushed to the scene in another patrol car, according to Chief Swaim. The two officers were told that Brown was sitting on the steps at a house a short distance from the cafe. The patrolmen left the two cars in front of Mac's and proceeded up the street to the house on foot. Neither officer knew Brown by sight and when they arrived at the house, they asked where the suspect was. Brown, Junior reported mumbled something which the officers did not understand. A woman standing on the porch pointed toward Brown. Officer Junior went up to Brown and picked him up off the steps, and when Brown reached toward his hip pocket, Junior grabbed his hand and searched the pocket, finding a .22 caliber pistol. After the first gun was taken from Brown, Boggus grabbed his hands and was holding him while Junior continued the search. The two officers apparently missed the second pistol which Brown had secreted between two shirts he was wearing. Junior started leading Brown toward the patrol car to carry him to jail, with Boggus trailing closely behind. Brown then pulled the second pistol, also a .22 caliber pistol with a six inch barrel and aimed over his left shoulder at Boggus and fired. The bullet struck Boggus between the neck and shoulder severing the officers jugular vein. After brown fired at Boggus, Junior whirled around and twisted the second pistol from the ex-convicts hand. Boggus, meanwhile, had drawn his service revolver and shot Brown. The bullet entered Brown's right side and came out the left side after going completely through his stomach. Boggus, then staggered across the street and fell down on the ground in a yard. Officer Junior, after seeing Brown slump to the ground and thinking him dead, rushed to the side of his fellow officer. He saw the officer had been hit and raced to his patrol car and called an ambulance for both Officer Boggus and Brown. Officer Boggus died at the Jackson County Hospital about an hour later from blood loss. Brown was transferred to the Veteran's Administration Hospital in Birmingham about Mid-afternoon and died later that night. 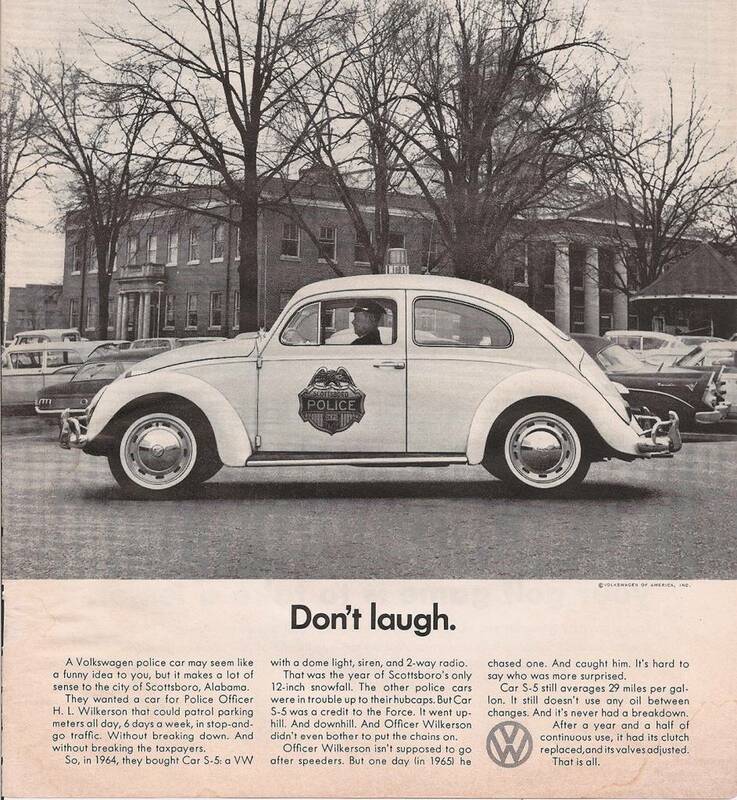 The Scottsboro Police Department was the only Department in the nation to have a Volkswagen Beetle Police Car back in the 60's , the car was featured in Life magazine, a scan of the article featuring it is shown below. 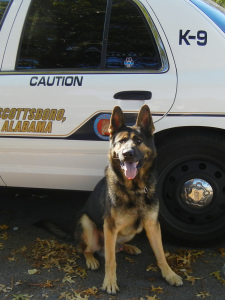 On May 28, 2007 the Scottsboro Police Department enhanced their capabilities to serve the Scottsboro citizens by welcoming Mato to the force. Mato was born in December of 2005, in Czechoslovakia. Mato was a German Shepard and had received special training to detect six (6) different odors of narcotics. He had also been trained for tracking people and police patrol. Mato was formally trained by the Huntsville Police Department's K-9 training program and has been nationally certified as a dual purpose police dog. The Scottsboro Police Department utilized Mato to assist with patrol, rescue, tracking, and drug enforcement, Mato also did routine school searches in Scottsboro and Jackson County. Mato competed in trials held in Marshall County in April 2008. There were approximately 60 K9s and handlers present from Region 22 (Alabama and Georgia). Many have competed numerous times without winning awards. This was Mato's first competition! We were very proud of Mato. In November of 2013 the Scottsboro K-9 Unit was dissolved. Mato was retired and donated to a Search and Rescue organization, where he stills helps today. 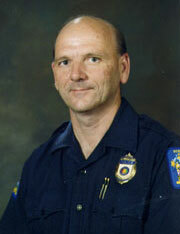 Keith Smith was Chief of the Scottsboro Police Department from 1980-2006. Chief Smith was hired as an officer in 1971 and was later promoted to an investigator. His perseverance and work ethics led him up the ranks to Administrative Assistant. In 1980, he was appointed to acting Chief and was later given the permanent position of Chief of police. Chief Smith has earned degrees in police science and business at Northeast State Community College. Chief Smith is a graduate of the FBI National Academy in Quantico, Va. and belongs to the FBI Academy Association. He is also a member of the fraternal Order of Police and the Alabama Chiefs Organization. Chief Smith started his career in law enforcement when he joined the United States Army in 1966 and was assigned to the military police. He served one year in Vietnam and was honorably discharged in 1969. When he returned to Scottsboro, he joined the Scottsboro Police Department in 1971.